Over the past few months of being out of school, I have figured out my process for learning a piece of music. I have a full system, from reading a piece for the first time to maintaining a piece you have already learned. Without further ado, here is how I learn a piece of music. The first thing I do when I start working on a new piece is sight read it. I usually try to do this without hearing the piece first. When I was still new to the flute, hearing either a recording or my teacher helped me figure out how the piece should sound. When I sight read a piece, I try to get through it with as few stops as possible. I like to save stops and starts for when I am actually working on a piece. My goal for sight reading is to get the basics under my fingers and to figure out which parts will need more attention and which parts I can simply run through. If you want to see my tips for successful sight reading, let me know in the comments! After I have sight read a new piece, I will either move on to a different piece, or I will start working through the piece. When I start working on the piece, I start to really study it. I find at least one good recording, if not multiple, that I can listen to for inspiration. This is also the stage where I start chunking the piece. I look for the more difficult parts and the easier parts. I will also mark in things like accidentals and difficult rhythms. After I have worked through the easy parts, I can then focus on the more difficult ones. 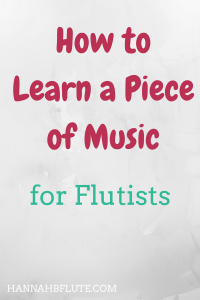 Yes, it’s hard to work on the tricky stuff, but that is what will make you a better flute player. Score study is also very important at this stage. If there is a measure or phrase that I don’t fully understand, I can look at the score to see what the accompaniment is doing. Studying the score also helps me when it comes to fast runs. The flute part may have no obvious harmonies, but it could be a simple chord or arpeggio. The accompaniment part is very helpful when it comes to finding the harmonies. After I get really comfortable with a piece of music, I start to practice performing it. Even if I will never actually play it in front of others, performance practice has many benefits. First, I get to practice my stamina. When you perform a piece, you can’t just stop in the middle of it. You might have a rest here or there, but you need to get through the whole piece without stopping. Second, I can figure out what notes or phrases are still causing me issues. When I play a measure or phrase, it will often seem more polished than it really is. Putting the piece back together brings those problems to my attention. I can then go back to the learning stage and work more on those problem areas. After I have fully learned a piece and practiced performing it, I then move it into the maintenance stage. This is where I put pieces that I have already learned and performed but I don’t want to lose the work I put into them. Now that I am preparing for graduate school auditions for next year, I have a couple of pieces and excerpts that are in maintenance mode. These are pieces that I have already studied, but I need to keep up with. They are commonly asked for in graduate auditions, and I don’t want to have to relearn these pieces. Also, as an aspiring flute teacher, I need to be able to demonstrate pieces and phrases for any future students. I don’t want to feel like I’m reading a piece that I am teaching to a student. How do you learn and study a piece? Do you listen to it first? Do you keep up with any old pieces? Let me know in the comments! Be sure to subscribe below for exclusive updates and tips! I’ll add it to the list of posts to write!